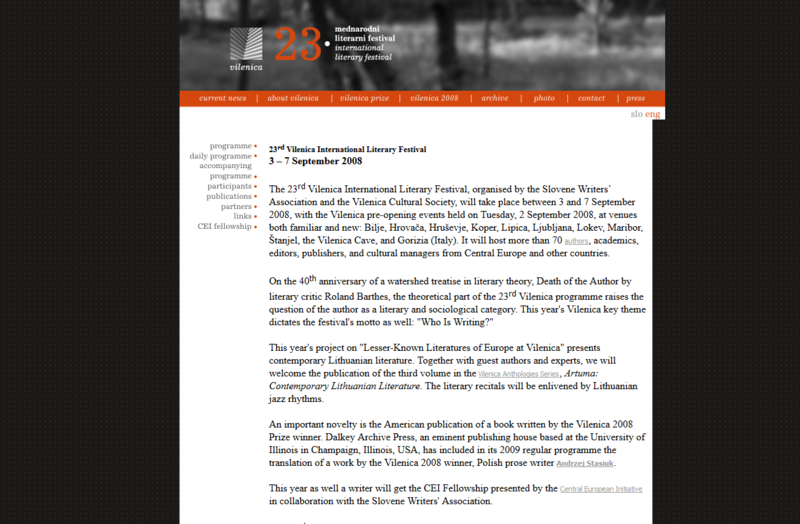 The 23rd Vilenica International Literary Festival, organised by the Slovene Writers’ Association and the Vilenica Cultural Society, will take place between 3 and 7 September 2008, with the Vilenica pre-opening events held on Tuesday, 2 September 2008, at venues both familiar and new: Bilje, Hrovača, Hruševje, Koper, Lipica, Ljubljana, Lokev, Maribor, Štanjel, the Vilenica Cave, and Gorizia (Italy). It will host more than 70 authors, academics, editors, publishers, and cultural managers from Central Europe and other countries. This year’s project on “Lesser-Known Literatures of Europe at Vilenica” presents contemporary Lithuanian literature. Together with guest authors and experts, we will welcome the publication of the third volume in the Vilenica Anthologies Series, Artuma: Contemporary Lithuanian Literature. The literary recitals will be enlivened by Lithuanian jazz rhythms. An important novelty is the American publication of a book written by the Vilenica 2008 Prize winner. 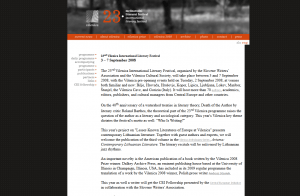 Dalkey Archive Press, an eminent publishing house based at the University of Illinois in Champaign, Illinois, USA, has included in its 2009 regular programme the translation of a work by the Vilenica 2008 winner, Polish prose writer Andrzej Stasiuk. This year as well a writer will get the CEI Fellowship presented by the Central European Initiativein collaboration with the Slovene Writers’ Association. The 23rd Vilenica Festival will offer a rich and dynamic programme with accompanying events, including such highlights as Literary readings evenings with Vilenica guests, organised in collaboration with the prospective Slovene publishers of their translated works in 2008; a presentation of literary creativity in the Slovene dialect of Rezija (Val Resia); and a programmatic literature and music block. In addition, the festival will be accompanied by various publications prepared for the occasion. We would like to express our thanks to all the partners and sponsors of the Vilenca 2008 who have helped us carry out the festival.